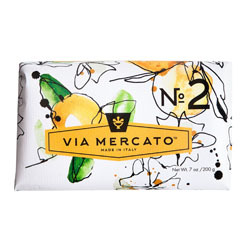 New Via Mercato Soaps have been added to our gift store. 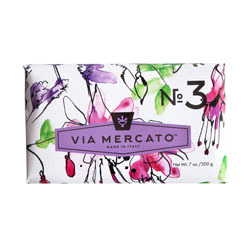 Via Mercato Soaps are a thoroughly modern soap inspired by the traditional flavors and aromas of flowers, fruits and herbs found in the centuries-old charming neighborhood markets (mercato) found throughout Italy. Via Mercato (pronounced “VEEYA mer-KA-toe”). 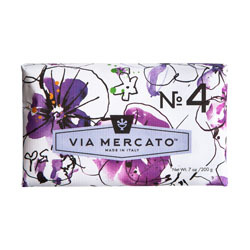 Via Mercato Soaps start with love, as do all things made in Italy. A love of beauty, artistry, and quality found throughout the local markets. A curated assortment of modern fragrances inspired by journeys through those markets that celebrate flavors, aroma and life. Enriched with the skin-caring ingredients of Shea Butter, Glycerin, Italian Olive Oil, and Coconut Oil, this soap gently removes dirt and grime, leaving skin feeling loved. No. 2 features the fragrance of Green Tea with a hint of White Musk. No. 4 features an intriguing blend of fragrances including Violets, Magnolia and Amber. No. 5 has a modern, fresh floral fragrance of Water Lily grounded with woodsy Sandalwood. No. 6 has a creamy green and floral fragrance of Fig, Orange Blossoms, and Cedarwood. No. 7 has a sunny, fruity and floral fragrance of Peach, Fig Blossoms, and Rose. No. 8 has a warm, spicy fragrance of Clove, Vanilla Flower and Orange. Now available in-store and via our web-store by clicking here.